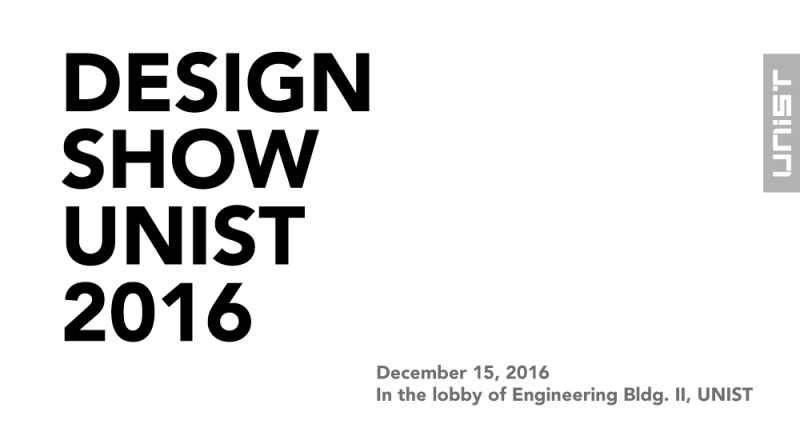 UNIST’s annual graduate exhibition, ‘Design Show UNIST 2016’ kicked off this afternoon, featuring the works of twenty arts and engineering students embarking on their careers as artists and creators. From traditional media to installations and even architectural work, the range of work on display is remarkable. This year, the exhibit placed a significant focus on the development and commercialization of innovative daily necessity products. These creative projects will be on display in the lobby of UNIST Engineering Building II from December 15 to 19, 2016. The final artworks, displayed at Design Show UNIST 2016 are the results of the graduation projects where students design and provide companies with lucrative design ideas for their products based on the knowledge they obtained during their academic journey. The goal of this educational collaboration is to commercialize the displayed projects through the appropriate collaboration between enterprises and student designers. Among many creative artworks, one attention-grabbing piece was the product design of rice wine bottle caps, designed by UNIST’s design school in partnership with the local rice wine manufacturer, Boksoondoga. 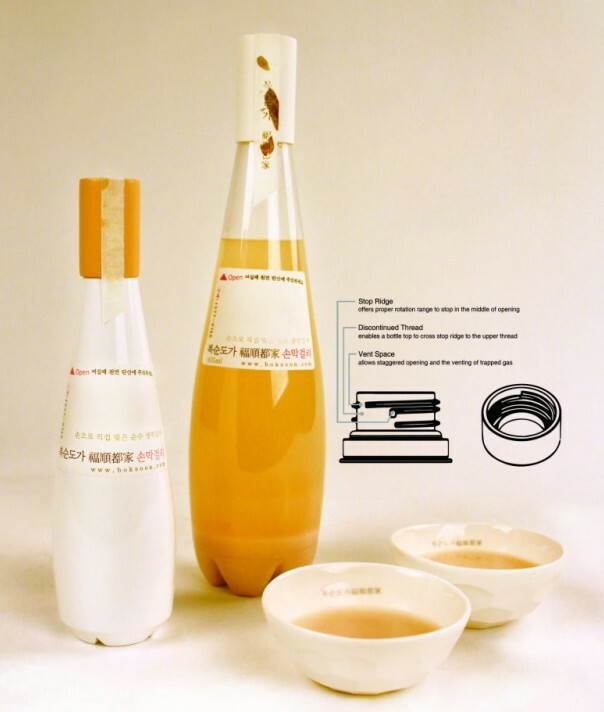 Their fermented rice wine made with natural yeast had problems of excessive overspill due to the carbonated nature of the beverage and its further fermentation during shipping. Easy-open Bottle, designed by UNIST’s design school in partnership with Boksoondoga: Prof. James A. Self, Prof. Chajoong Kim, Prof. Minkyu Kim, and Sungkeun Lee. 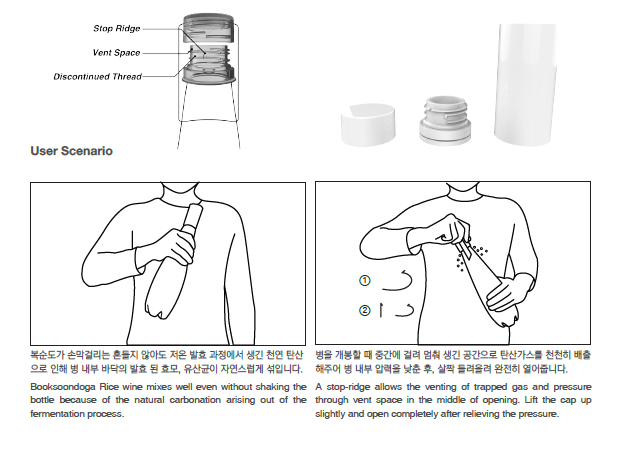 “This patentable ‘stop-ridge’ and ‘discontinued’ bottle-top thread and cap design allows the venting of trapped gas through a specially designed vent space, thereby preventing the overspill of the beverage,” says SungKeun Lee, a graduate student of Creative Design Engineering. Sticky-up, designed by UNIST’s design school in partnership with Skill-Up: JiHyun Lim of Energy and Chemical Engineering, Prof. Kwanmyung Kim, Prof. Youngwoo Park, and Prof. Chajoong Kim. Another exhibited graduation work is Sticky-up, a paper-based tangible programming learning kit for teaching children electricity. Designed by JiHyun Lim, a graduate student of Energy and Chemical Engineering at UNIST in partnership with Skill-up Co., Ltd., the book aims to help children understand how electricity flows from a power source through wires. For instance, a child first learns about the basic principles of electricity, then uses the assorted peel-and-stick electronic stickers to create a circuit, as outlined in the book. Sticky-up is a result of collaboration with Skill-up Co., Ltd., a web-based service platform where people can share and learn making knowledge and skills easily. The Graduate School of Creative Design Engineering at UNIST provides an interdisciplinary collaborative education on design and engineering which aims to cultivate capable design professionals equipped with scientific and creative problem solving skills. The program aims to develop innovative products and turn them into a profitable business by operating project-based programs through partnerships with local companies.